I was seven years old and looking forward to Christmas. I had asked for a number of things as usual, but this Christmas was going to be the best. Of course I said that every year, but this year I actually believed it. I knew there was a particular closet that was off limits to my brother and myself because that was where Mom hid the presents. I had never looked in the closet or even opened the door! I can't speak for my brother however. But this year for some reason I was tempted to open the closet. So one day when my mom and brother were outside and my dad was at work, I opened the door. I couldn't believe how crammed the closet was. It was a very small closet that had been built into the space under the stairs. There it was! A huge box! I opened it up and found the most beautiful stuffed dog that I had ever seen. The dog was almost as big as I was. I knew it would look great in my bedroom. 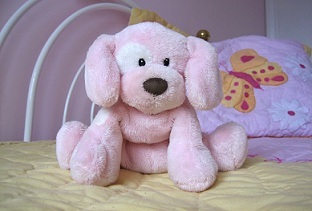 It was pink, like me bedroom and it had lots of soft fur. I loved it. I actually took it out of the box and hugged it. Of course I had to hurry because I didn't know when my mom and my brother would return. I just knew the present was for me! I was so excited! When they came back in, I acted like nothing had happened. I just smiled to myself because I knew that soon I would be the owner of the dog! I just kept thinking about it for days and days. After some time, I started to feel a little guilty. I knew that I shouldn't have snooped. I knew that I had been warned not to snoop. But the temptation had been just too much. Christmas Eve came and we were to open our presents as was custom in our family. For some reason I wanted to open the other gifts first. I saw the big box sitting there and just kind of ignored it. When it came time to open it, I "faked" a surprise look. My parents took a picture as this was my biggest present and they wanted to capture the look on film. It turned out to be the worst Christmas gift ever. It was "spoiled" and I had spoiled it. I lived with the guilt and shame of doing this. Later that year I confessed to my mom what had happened. I never snooped again. Mom continued to use the closet to hide things but I had learned my lesson. The best present I ever got turned out to be the worst Christmas gift all because of me. To this day, some 50 years later, I have never ever snooped again. I love surprises and I would like to keep it that way. Join in and write your own page! It's easy to do. How? Simply click here to return to Worst Christmas Gift.